Turns out Preston and I miss our scooters more than we thought. 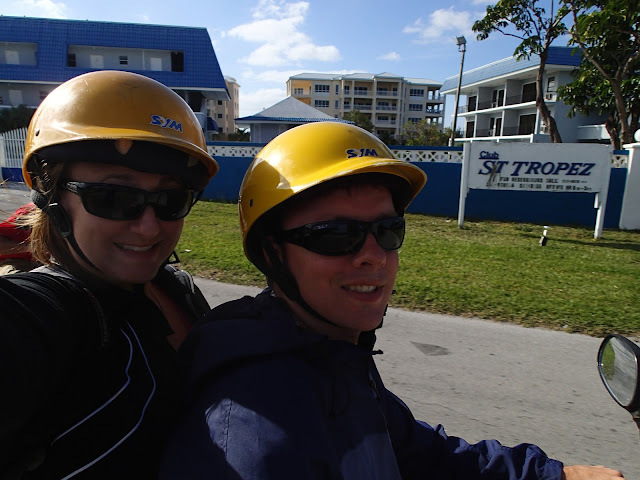 We had been feeling a little holed up so we rented some scooters for 24 hours. We had a few errands to run and needed to get out of the marina. We walked for a while then hopped on the local bus for $1.25 each and ended up at the Lucayan Market or tourist central. Which is appropriate because the scooters scream tourist. With our matching safety yellow helmets we were ready to hit the town. Driving on the left side of the road is a tricky thing to get used to! First up stop by the store and stock up on food. We then scooted our way to a marine supply store where we learned the place we took our tank to get fixed is known for overcharging and ripping off their customers. Good thing they have been closed since Friday and haven't started work on our tank yet. They will be back tomorrow and we will be hitching a ride to pickup the tank and take it to the new place we found where they will take the measurements they need and fabricate us a brand new aluminum tank. The options on our old tank were some kind of epoxy on the hole and then coat the whole tank in some kind of liner, cut the top off and weld on new sides and bottom, or have a new tank made. We don't just want to prolong the problem and deal with it later so that is why we will have a new tank made. Although we will probably also coat the bottom of the new tank with rhino liner just to try and prevent any corrosion. After the marine store we went back to the boat for a nap so we could stay awake till midnight and celebrate the new year. We went all out for New Year's and took ourselves out to a restaurant for dinner and then celebrated at the marina we bypassed to stay at our little gem. They had a great band that had the whole crowd movin' to the beats. The scoots were a little scary to drive at night as Dan's has a headlight but no tail light and Preston's has a tail light but no headlight!!! We drove as one with Dan in the front and us in the back. We made it safely back to the boat around 1:00am. Holidays feel different when you don't have jobs and all the days mesh together anyway. Doesn't seem any different that our other days. Hope you all had a New Year's as entertaining as we did. :) I just can't get over how much I want to be with you guys. Thanks for keeping me with you by your posts! Love ya tons. Wow, you guys have been busy. I have a lot of reading to catch up on your adventures. Hope all is well. Happy New Years !! I wish I could say happy sailing. Think positive and keep pushing forward. I am very happy to hear there will be a new tank instead of repair. Miss you!! Hey, It's Grama Cleo. We tried to get some face time while everyone was here at 11:59 :2012. We couldn't get a connection. Glad you were Swinging in the dock. Hey Pres. I saw your pics motoring down the ICW --I forgot to tell you when we were floating down the ICW with the Whites on our Yacht/fishing boat, everybody was "seasick" but me.